When you have a little baby on average you can change a dirty diaper 7 times and more a day. I know that sounds crazy because by the end of the month you could have changed over 200 diapers easily. Therefore, I think it is important to have a good changing pad on your changing table. Because your little one will spend, many times on that pad getting their little bottom changed. Plus, after baths it is my go to place to lotion up my little one and put on their clothes. With my little one, going to be spending so much time on a changing pad throughout the day I want something that is comfortable, provides a safe environment and offers no harmful chemicals. I had the chance to work with NaturePedic on a review for my ‘Baby Gift Guide’. During my review, I received the 2-Sided Contoured Changing Pad, which offers exactly what I am looking for in a diaper pad for my changing table. 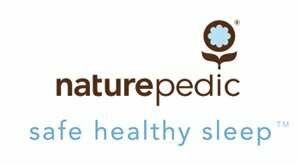 Naturepedic manufactures a variety of baby crib mattresses, changing pads, mattress pads, and other bedding accessories made with natural, organic, and non-toxic materials designed to eliminate harmful chemicals and provide a healthy sleep environment. All Naturepedic products are certified by GREENGUARD. Features a luxurious organic cotton fabric with a clear 100% polyethylene food-grade waterproof coating. Non-allergenic and easy-to-clean. Organic Cotton Filling and chemical-free. Features Air-Core, a non-toxic environmentally friendly support layer made from 100% food-grade polyethylene. 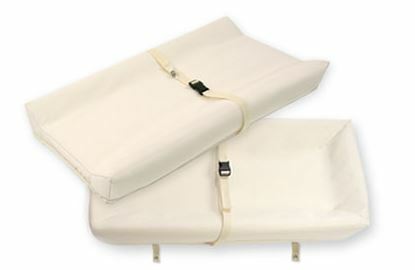 Air-Core is a network of closed cell air pockets that provide a firm and comfortable base without the concerns of polyurethane foam or latex rubber. When I had bought my baby girls changing table a few months ago it came with its very own changing pad. However, the pad that came with the table was plastic and thin feeling. It is not comfortable in anyway. When I received the Naturepedic 2-Sided Contoured Changing Pad, I was immediately impressed with it. I immediately took the flimsy thin changing pad off the table and placed the new changing pad on the table. I am happy that the pad comes with a set of snaps that can screw onto the changing table. If I had a dresser as a changing table, I would also have the ease of mind that it would stay in place even without rails. However, I have rails with my changing table but it is nice to know that they have thought about everyone no matter the type of changing area that one may have. I love the size of the pad. It is much thicker than any pad I have seen personally. The length and width fit perfectly onto the changing table without moving freely. Another nice feature is the texture of the pad. It offers a waterproof surface making it easy to clean when you have those moments when your little ones decides they need to pee again while being changed. Even with it being waterproof, it still offers a comfortable laying spot for the baby. The other thing I happened to notice was the changing pad came with an attached buckle. This allows you to keep your little one in place when you are changing their diaper. Many pads do not offer these. I know the price tag for the Naturepedic 2-Sided Contoured Changing Pad is a bit higher in price of $99 than other changing pads. However, when you have this changing pad you can take in consideration that it is made of the best quality material, it is non-toxic, and it is much thicker and comfortable then other pads. I also love the fact that my baby girls diaper pad cover fits perfectly on the changing pad. You can show some love by liking Naturepedic on Facebook and on Twitter. Where to purchase: You are able to make a purchase from the Naturepedic website. Disclosure: Other than receiving a free sample of the product from Naturepedic, I was not paid for any of the opinions or reviews expressed on this blog. Regardless, I only recommend products or services I use personally and believe will be good for my readers. Your opinions may vary from my opinions. I cannot be held responsible for prizes not shipped to giveaway winners directly from the sponsoring company. It is the responsibility of the company sponsoring the giveaway to ensure the prizes are sent to the winner. I am disclosing this in accordance with the Federal Trade Commission's 16 CFR, Part 255: " Guides concerning the Use of Endorsements and Testimonials in Advertising. You can also go here and read my PR Polices.